WHITE MARSH, Md., (February 26, 2019) – TIC Gums will introduce new ingredient solutions for plant-based formulating at Natural Products Expo West 2019. The company will be showcasing the new solutions in four prototypes that tap into one of food industry’s largest trends: plant-based eating. 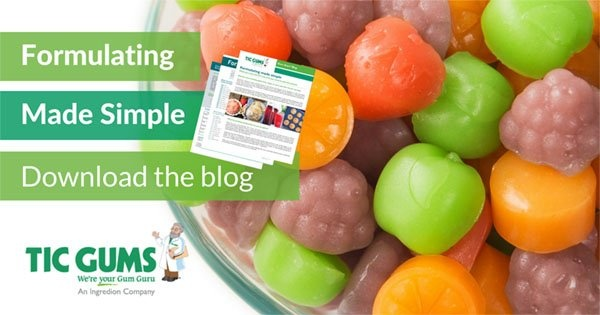 Stop by booth #1937 to see the Ingredion Family of Companies and chat with the Gum Gurus® to learn more about how TIC Gums is developing simple solutions for specific formulating challenges. TICorganic Ticagel GC-553 is an organic system designed to stabilize and control syneresis in gummies fortified with nutritional oils. A vegan, organic gummy model made with TICorganic Ticagel GC-553 will be available to sample at Expo West. The prototype showcases a 0.5% oil load using coconut oil, but TICorganic Ticagel GC-553 can support oil loads up to 15%, creating an ideal, gelatin-free delivery system for a full spectrum of oils. TICorganic Ticagel GC-553 allows formulators to easily and efficiently reach the label claim requests that continue to penetrate the market, such as organic compliant and vegan. Simplistica YG 3206 ingredient system leverages faba bean protein and an optimized blend of stabilizers to enhance texture and mouthfeel in vegan yogurt fortified with protein. To showcase the functionality of Simplistica YG 3206 ingredient system in plant-based yogurt formulations, TIC Gums has developed a cashew yogurt with turmeric and black pepper that will be available for sample at Expo West. This cashew-based yogurt delivers five grams of protein and addresses common challenges when working with vegan formulations from maintaining protein levels in line with dairy counterparts to protecting texture and taste. Dairy-free fortified instant beverages often have an increased amount of perceivable particulates due to the addition of plant-based proteins, vitamin-mineral blends, fiber and other nutritional ingredients. To target texture in these protein beverages, product developers can leverage the benefits of Ticaloid Ultrasmooth CL. This cold-water soluble hydrocolloid system suspends and stabilizes protein shakes and meal replacers while also improving mouth coating with label-friendly ingredients. To showcase the functionality of Ticaloid Ultrasmooth CL, TIC Gums has developed a plant-based matcha chai instant shake available for sampling at Expo West. The prototype also features Simplistica BV 0358, an ingredient system that builds back sweetness and functional properties when formulators develop reduced or low sugar beverages without compromising on texture or flavor. As with many non-dairy applications, non-dairy frozen dessert formulators must work to deliver a recognizable and enjoyable eating experience that mimics that of full-dairy counterparts. Dairyblend Natural IC 21 is a label-friendly stabilizer blend that provides freeze/thaw stability, emulsification and mouthfeel to premium grades of non-dairy and dairy frozen desserts. It is a versatile blend that allows for simpler labeling as it can be used without added mono & di-glycerides. Dairyblend Natural IC 21 will be featured in a mango lassi-inspired frozen dessert prototype available for sampling at Expo West. Take your idea — and emerging company — to the next level with resources, expertise and plant-based ingredient solutions that can help you grow. Visit the Emerging Business Booth at Expo West Booth #2117 to meet with real emerging companies who have grown with the Ingredion Family of Companies. They will be showcasing their newest products created with ingredient solutions from Ingredion, TIC Gums and Kerr. Label claim transparency continues to be front of mind for consumers. TIC Gums is committed to producing ingredients that allow manufacturers to communicate clearly and honestly with their customers. “We’re proud that we can provide food and beverage manufacturers with Non-GMO Project Verified ingredients that align with the growing demand by consumers for Non-GMO Products,” says Veronica Burnham, senior regulatory specialist at TIC Gums. Formulators are encouraged to engage with our Gum Gurus® to assist in formulating for specific label claim goals, including Non-GMO Project Verified. To speak with a Gum Guru about your specific texture, stability and nutrition needs, call our technical service hotline at (800) 899-3953 or visit ticgums.com/chat to reach a specialist. We will work with you to find the right solutions for your desired applications. WHITE MARSH, Md., (July 11, 2018) – TIC Gums will introduce the Simplistica™ line of ingredient systems at IFT 2018. Simplistica ingredient systems are optimized solutions from TIC Gums that leverage the best technologies hydrocolloids, starches, plant proteins and sweeteners have to offer. These complete systems are developed to ease the formulation frustrations associated with stabilizing and texturizing applications that include alternative proteins and aim to reduce sugar. TIC Gums developed Simplistica ingredient systems to simplify the formulating process, allowing for easier and faster product development. Simplistica ingredient systems cut down on formulating time and R&D troubleshooting by combining necessary ingredients at optimal proportions. Formulating with Simplistica ingredient systems also allows food and beverage developers to easily align their label with claims such as organic, vegan, non-GMO and more. Simplistica systems make it possible for food developers to leverage the legendary customer service from TIC Gums in a more comprehensive way. With these ingredient systems, developers are able to provide a nutritionally and texturally sound product using ingredients that have been selected by the Gum Gurus® at TIC Gums for product optimization. Simplistica YG 3206 ingredient system is a new product from TIC Gums that leverages faba bean protein and an optimized blend of stabilizers to enhance texture and mouthfeel of vegan yogurt fortified with protein. To showcase the functionality of Simplistica YG 3206 ingredient system in vegan yogurt formulations, TIC Gums has developed a coconut milk yogurt prototype which will be available at IFT. This coconut milk based yogurt delivers five grams of protein and addresses common challenges when working with vegan formulations from maintaining protein levels in line with dairy counterparts to protecting texture and taste. Simplistica BV 0358 ingredient system is a new product from TIC Gums that combines plant-based sweeteners and a single ingredient hydrocolloid to replace sugar and maximize taste and texture. To showcase the functionality of Simplistica BV 0358 ingredient system in flavored water applications, TIC Gums has developed a black raspberry flavored water prototype which will be available at IFT. The flavored water has a 50% reduction in sugar and is Non-GMO and gluten free. Simplistica BV 0358 from TIC Gums helps formulators develop reduced or low-calorie beverage formulations without compromising on texture or sweetness. Simplistica BV 1325 ingredient system is a new product from TIC Gums that utilizes pea-based plant proteins and hydrocolloids in the ideal ratio to provide protein fortification, enhanced texture and stability and an optimal drinking experience in ready-to-drink (RTD) beverages. To showcase the functionality of Simplistica BV 1325 ingredient system in protein beverage applications, TIC Gums has developed a vanilla cake RTD beverage prototype which will be available at IFT. This protein beverage delivers 20 grams of protein while maintaining such label claims as vegan and gluten free. Simplistica BV 1325 ingredient system from TIC Gums allows formulators to deliver a great tasting, nutritional beverage that is label friendly. WHITE MARSH, Md., (June 11, 2018) – TIC Gums now offers certified organic tara gum, TICOrganic® Tara Gum HV, as another tool in its broad portfolio of hydrocolloids, expanding its capabilities of providing unique solutions to formulation challenges. Due to its galactomannan structure, TICorganic Tara Gum HV can be used as alternative to other galactomannans, such as locust bean gum (LBG) and guar gum, in certain applications. Similarly to LBG and guar, tara provides thickness and creaminess, as well as an enhanced eating experience. Consumers now more than ever are watching for specific label declarations on their finished goods. According to Innova Market Insights, there was a 13.5% compounded annual growth rate (CAGR) in launches of food and beverages with front-or-back of package organic claims from 2013-2017. Leveraging the texture and stability functionalities of TICOrganic Tara Gum HV in a food or beverage formulation will help food developers meet their organic label claim goals. Formulators are encouraged to engage with our Gum Gurus® to assist in formulating with tara gum. To speak with a Gum Guru about your specific texture and stability needs, call our technical service hotline at (800) 899-3953 or visit ticgums.com/chat to speak with a specialist. We will work with you to find the right solutions for your desired applications. WHITE MARSH, MD. -- Sixteen local high school students with interests in science, culinary and marketing participated in the fifth annual Ice Cream University hosted by TIC Gums at the Texture Innovation Center in White Marsh, MD. The program is modeled after Cornell University’s Food Science 101 course, a requirement for incoming freshman of the College of Food Science. TIC Gums sponsored each student’s $500 program fee and provided home ice cream makers upon program completion. The winning ice cream flavor, named Farmer’s Fight, was created by Trey Wooten of Patapsco High School; Jonathon Parks of Fallston High School; and Anthony Sulinski of Bel Air High School. Tim Andon, Business Development Manager at TIC Gums and Cornell alumnus, led the five week course. “We are so excited to be hosting our sixth annual Ice Cream University. Year-over-year, this program has meant so much to TIC Gums and our mission to educate the public about food science. We want to make kids excited about the food industry and inspire them to ask more questions and discover a potentially unknown passion,” said Andon. The five-week long program featured three areas of focus. The first weeks of study were dedicated to scientific principles, such as emulsions, overrun calculation, ice crystal formation and statistical know-how for tracking and maintaining quality. The attention then turned to flavor selection and inclusions, like nuts, chocolate or fruit. Finally, the students shifted focus to finalizing the product packaging and marketing. During the last session, students presented their flavor and branding to the judges. The students’ ice cream and marketing presentations were judged on Saturday, May 5 by a tasting panel. Farmer’s Fight, a mixed berry, green tea yogurt with honey crunches, will be produced by the students and sold in the coming weeks at Broom’s Bloom Dairy located in Harford County.